Since I first accepted the new role as a flavor correspondent for Sargento, working in conjunction with Rick Bayless’ list of Top 10 Food Trends, I have started to experiment with new ingredients and combinations and to read about some of the ethnic cuisines that are less familiar to me. I am having fun in the kitchen, for sure! While we are certain to see many of these trends popping up on restaurant menus, I am excited to stretch my own cooking boundaries and incorporate new concepts in a way that is approachable and appealing to all of us home cooks. This is the sort of challenge that gets my creative juices flowing. I mentioned previously (click here for more details and photos) that I have been tasked by Rick and Sargento to create recipes over the coming year surrounding the trends of braised meats and bitter greens. Of course, these won’t be the only recipes I create, and I do plan to dabble in some of the other trends. I thought many of you would be interested in reading a bit about what’s “hot” in the world of food, and I would love for you to weigh in. What trends look interesting to you? What types of recipes would you most like to see? After the trend list, I am sharing a recipe inspired by Chef Rick Bayless himself. When we spoke with Rick that day in Wisconsin, I mentioned one of my go-to easy dinners — Kale and Eggs. 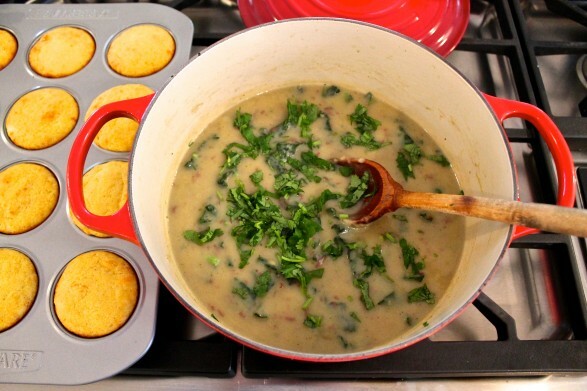 He loved the dish and shared one of his favorite quick meals he makes for his daughter — a potato soup with roasted poblano and kale. At 42 years of age, I am finally starting to embrace heat in my cooking yet had never roasted a poblano. So, as a kick-off to this flavor journey, I roasted a poblano and made my own interpretation of what master chef Rick Bayless whips up in his home kitchen. I hope he approves! Middle Eastern Flavors: Think beyond hummus and consider using a deep red powder called sumac. This lemony spice will add a depth of flavor to everything from tacos to tuna. For a fun snack and an introduction to sumac, Rick had us dip chunks of cheddar-mozzarella in pomegranate molasses and then in sumac. This spice is not one to shy away from. Tacos: While this casual food has long been a favorite, the trend centers on the versatility. Using a tortilla as a holder for any number of fillings is fun and can be used to highlight any country’s cuisine. Tortillas are every bit as welcoming to a Korean combination of braised beef and Kimchi as they are to pulled pork and barbecue sauce or the age-old ground beef standard. Habanero Peppers: The extreme heat of this pepper can be mitigated with dairy, like cheese or cream. Likewise, the seeds and veins can be removed to tone down the heat and bring out the fruity flavor of this spicy gem, which can be unexpectedly paired with fruits such as strawberries or mango in a salsa spooned over grilled chicken or fish. Greens: While kale will remain front and center for its versatility and health appeal, an army of bitter greens such as arugula, mustard, collard, dandelion, turnip, and beet greens will show up on restaurant menus and in markets. As the least bitter green on this list, beet greens are a great place to experiment in your own kitchen, adding them to a stir-fry or a hearty soup. Mushrooms: Wild and cultivated mushrooms can add depth of flavor and texture to a simple baked chicken and rice or braised beef dish and contribute exceptional flavor and meatiness to vegetarian recipes. Dried mushrooms can be kept in your pantry and rehydrated as needed to create a simple sauce that will dress up simply grilled steak or pan-seared chicken. Peruvian Foods: While you may more likely order ceviche in a restaurant than serve it on your own dinner table, quinoa is an ideal way to embrace this new trend. I enjoy quinoa as a base for both sweet and savory salads, in dinner and breakfast recipes, and have even used it to make granola and muffins. This high-protein, gluten-free grain is truly a blank canvas on which to start painting. Fermented Foods: We know a thing or two about fermented foods in Lancaster County, and this trend includes and extends beyond our New Year’s Day tradition of sauerkraut. Kimchi, a Korean dish of fermented vegetables and spices, can be used as a flavorful condiment on burgers or tacos. Additionally, making cheese or yogurt at home has become increasingly popular as people take to the concept of making and preserving food as both a hobby and a way to create unique flavors. Braising Meats: Rick Bayless commented, “This is not exactly a new trend but a trend that won’t go away.” How satisfying is it to walk into the house and smell the intoxicating aroma of a meal that basically cooked itself in your Crock Pot? While tender, slow-cooked beef, chicken, and pork will continue to satiate us, this trend has me thinking about a different approach to fish as well. Street Food: Why do lines form for food truck offerings? People are attracted to the casualness, and go back for the flavor. This is an opportunity to sample authentic ethnic cuisine or a really good burger. Street food satisfies our stomachs and broadens our horizons in a convenient, affordable way, and shows us basic, fresh ingredients and good cooking technique are the heart of great food. Herbs in Desserts: This aromatic trend is facilitated by the ease of growing herbs such as basil, rosemary, and mint in pots or a garden. It also bridges the gap between sweet and savory in an interesting, delicious way. Adding thyme to strawberry shortcakes or rosemary to a lemony pound cake are simple yet satisfying applications of this concept. 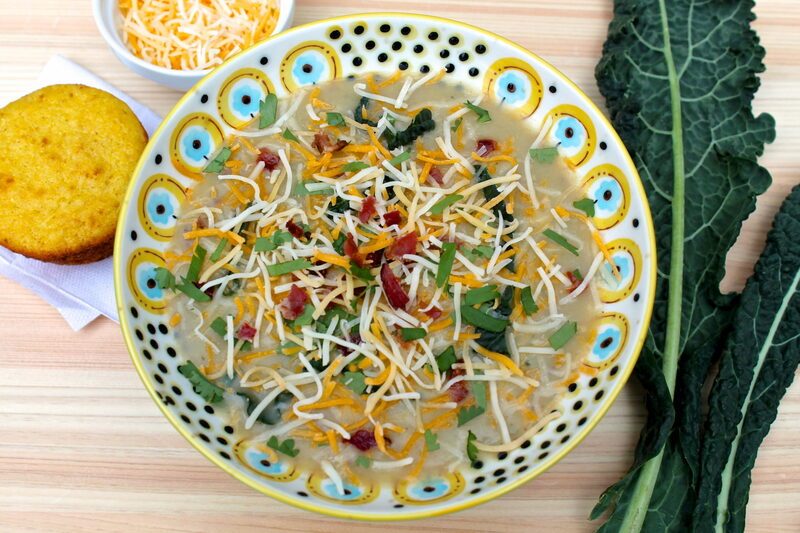 The roasted Poblano adds flavor and smokiness--but not too much heat--to this hearty yet rather healthy soup. For more intense heat as well as ease, a chipotle pepper in adobo sauce may be used. Rather than using cream as in many potato soups, a moderate amount of flavorful cheese is used. Greens add to the texture and health appeal. A side of cornbread is all you need to complete the meal. In a medium to large saucepan, sauté the bacon until crisp; remove to a plate. In the bacon grease that remains, sauté the onion over medium heat until soft and beginning to brown, about 3 minutes. Chop the potatoes. If using a soft-skinnned potato like a new potato, there is no need to peel. Add the potatoes and three cups of chicken stock, stirring and releasing any crusty brown pieces on the bottom of the pan; there is a lot of flavor there. Bring to a boil, then cover, reduce the heat, and simmer for 15-20 minutes or until the potatoes are very tender. When the pepper is charred all over, place in a paper bag and seal (you may also wrap well in a tea towel), and let sit for about 15 minutes. Then cut the pepper open, removing and discarding the stem and the seeds. Scrape the skin off the flesh and discard that, too. I find it easiest to use the paper bag to rub off the skin. Then chop the flesh. Add the chopped greens (I make 1/2-inch slices across the leaves, cutting those in half if the pieces are long.) Then add the cheese, the cilantro and the remaining broth until you achieve the thickness you desire. Simmer about 2 minutes more or until the greens are wilted. Taste and adjust for seasoning. I used 1/2 teaspoon kosher salt and several turns of the pepper mill. This will vary according to personal preference and what type of broth you used. Ladle into warm soup bowls, then sprinkle with additional cheese and cilantro, if desired, topping it all off with the reserved bacon. Ann, I just really read this recipe and I am soooo going to add this to my list to make. It looks delicious! I know you use kale in many of your recipes and I need to try experimenting with some.. I have made kale chips but that is extent of my cooking with kale. I do like kale for cooking because it is a little sturdier than the baby spinach we frequently see in our stores. However, spinach would certainly work–curly would be especially good–as would almost any sort of green with which you like to cook. If you aren’t sure about the kale, ease in with a more tender variety such as Lacinato or Tuscan if available. Ann, I started this last night for our dinner tonight. All I have to do is heat it up and then add the cheese and the chard (again NO kale at grocery) and remaining broth. Can’t wait to try it! Isn’t it nice to have dinner ready and waiting?…such a treat to yourself! I hope you enjoy this recipe, Mary Lou. Perhaps you could roast a few marshmallows for dessert…for old times’ sake!! Four thumbs up from us Ann! Hubby had 2 bowls and 3 corn muffins..
Yum! Thank you for so many wonderful recipes that are healthy as well as delicious. Yay! I am thrilled for all the thumbs up, Mary Lou! Thank you for the great feedback! Pingback: The Fountain Avenue Kitchen – What do you snack on?